Have you ever wished you could know if spending more money on a Facebook ad (or any other kind of advertising) would make you more money? Or someone could give you a hint, based on how your business is doing, where to focus your efforts on next. 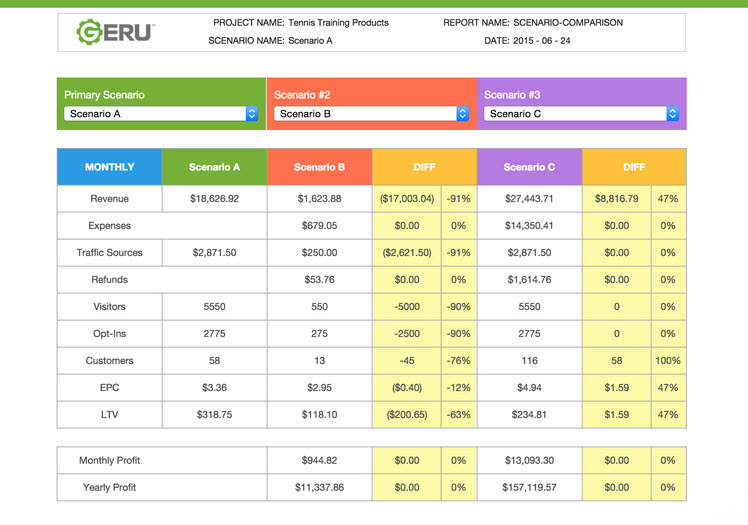 GERU is a patent pending business simulator tool that can do just that. It is a web based tool you input your financials into (income, costs, overhead etc) and it will simulate what your business would do if you made changes. I work with people that run tutor businesses and have done so for years. Here are some examples from their perspective of what the tool could be used for. Based on your current number of tutors – how much more could you make (or would you lose) if you hired someone to tutor? This could be used too if you had sales people – what would adding someone do. Review your Facebook ads, how much could you earn (using past results) if you spent another $500.00? What method of advertising you use now, is most effective? Again all very useful. Anything that adds money to your bottom line is a good thing. 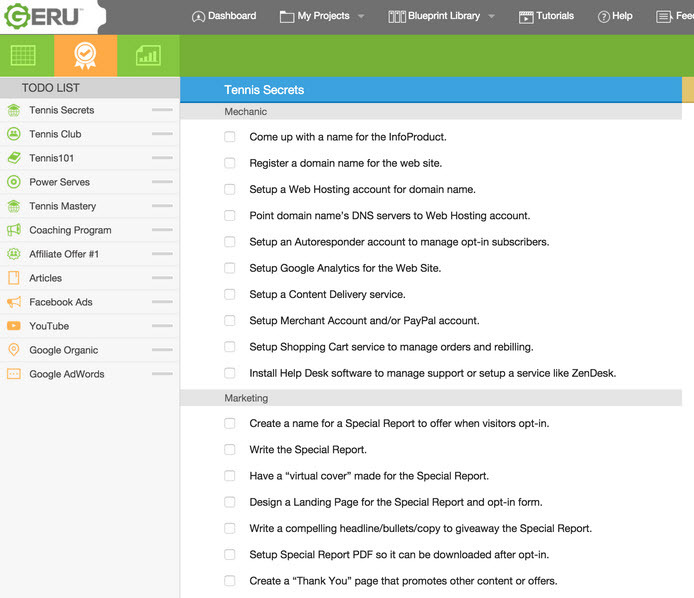 The main screen of the GERU dashboard. 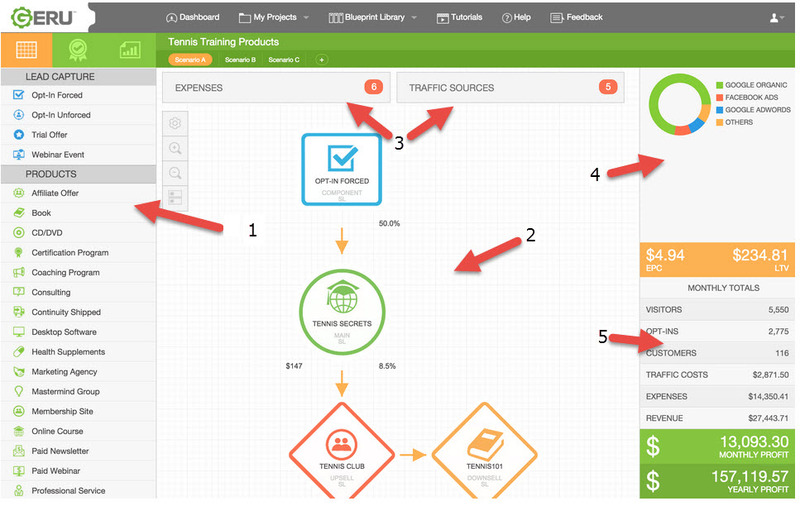 The left side of the dashboard shows how you’re capturing leads and what your sales funnels. Click on each of them and it will expand so you can input or revise the details. 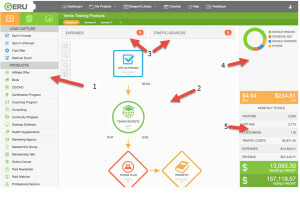 The middle of the screen is a visual representation of what’s going on in your business. If you click on Expenses or Traffic Sources tab, those will expand too. Right top, shows how your website is getting traffic. Bottom right shows at a glance how you’re doing. – And Much, Much More!! The software creates a to-do list, based on YOUR business that gives you step by step instructions on what will profit your business the most. My favorite part of GERU software is the ability to run scenarios and play them against each other. Example: How would it help my business if I spent $500 more on Google Ads… or I spend $500 on FaceBook ads. You’ll be able to find out what might happen based on the current results of your Google and FB spending. A very powerful software forecasting tool. 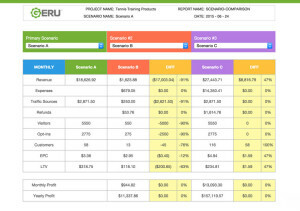 Here is a screenshot of the scenarios page. We have used the software for a few weeks and have already used it to help our business by finding hidden expenses we didn’t know about. We have also started to use it to help people in our Tutor Classes to improve their businesses. We are highly recommending it for them and you as well. Too many to list, I have enjoyed using the product, but the advice it has given me has worked. Just inputting what I was spending my money on, helped me to see at a glance that one of my hosting accounts was charging me twice as much as the others were. I should have known this of course, but sometimes we get too busy, the bills get paid and we work on whatever we’ve been doing. Taking the time to input the numbers will allow you to see any of those hidden things you might have been spending too much money on. BTW the savings from changing the hosting account will pay for the software in just a couple of months. I always tell you the good and the bad. After using GERU for a month I have found the following things that I don’t like very much. We’ve talked about the good; here are a couple of things I don’t like. Just like any tool you have to use it. If you don’t use it, it does you no good. 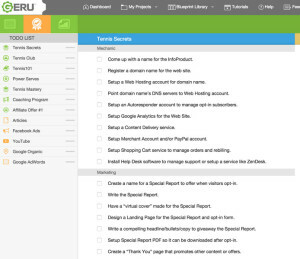 In order to use GERU you’ll need to input your information. The developers have talked some about creating some API’s but for now you’ll have to do that, and it does take some time. It isn’t hard though. I wish this product had been developed when I started my business. I could have saved thousands of dollars and hours of frustration by trying out things, only to find out that they didn’t work. You must use this link – to order GERU and get the bonuses. Make sure you clear your browser of cookies before you click that link. My favorite part of GERU is the simulations. Check out the screen shot below. Why you want to Buy GERU from me. These are listed in order that we deliver them to you. Note: Make sure you read how to claim your bonus. – IMMEDIATELY – after you order from us, we’ll give you access to a private Facebook group. I know you’ve been in groups before, but I can promise you haven’t been in one like this. The goal of this group is to actually get you to use the program that you’ve just purchased and not put it in the corner. We’ll also send you a copy of our Goal guide. A 60+ page pdf that will help you make goals for your business. – TWO WEEKS from when you buy. We’ll provide you a video of us setting up GERU. We’ll explain everything that we’re doing, so you’ll know what to do when you’re setting up. We’ll have explanations of all the various tools that you can use. One of the questions we ask when you send us the note (after buying from us) is what business you’re in. Based on those remarks we’ll give some specific guidance based on the business that you’re in. –> Already have a web presence – we’ll create a social media ad campaign for Facebook. We’ll fund your ad budget with $50, create a campaign with 2 different images / ads. How to claim your GERU bonus. Send you a note, telling you how to access the Facebook group and details on the 30 day bonus and in two weeks will send you the link for the GERU training. We’ll also send a link to the FaceBook group. We’ll be monitoring daily to answer questions and give you any assistance that you may need. Click this link to get the best GERU bonus. Affiliate Disclaimer: If you purchase GERU from us we will get a commission from your purchase. GERU will not do your business (or you) any good if you don’t use it.